Content is one of the most critical assets for every organization, embodying its knowledge and processes. How content is created, managed, and shared—and how users collaborate using that content—has gone through a drastic evolution from traditional enterprise content management (ECM) to dynamic content services. According to Gartner, “Content services platforms are the next stage of enterprise content management, representing a shift from self-contained systems and repositories to open services.” To truly deliver on the promise of content services, you must balance manageability with ease of use to unlock productivity gains around your critical business information. SharePoint delivers content services as the foundational content platform for Office 365, with capabilities for creating, sharing, protecting, and reusing information. Going far beyond merely storing documents, SharePoint hosts digital content like pages, videos, images, designs, 3D, medical scans, and markup as well as traditional documents. SharePoint embodies ease of use with ease of management—on any device, for any user, at any location. These innovations, along with customers’ transition to the cloud and the growing imperative for secure content collaboration and sharing, are driving growth across Microsoft 365, SharePoint, and OneDrive. More than 300,000 organizations now have SharePoint and OneDrive in Office 365, including 85 percent of the Fortune 500. Active users grew over 90 percent, and data stored in SharePoint Online grew over 250 percent in the last year alone. Gartner has recognized Microsoft as a Leader in the Content Services Platform Magic Quadrant for 2017. In addition to being positioned as one of only three Leaders, Microsoft is placed highest for Ability to Execute. Simplicity—SharePoint is quick and fast to set up, with a simple and clean user interface paired with easy but powerful management. Content services across Office 365—SharePoint has also become the content services layer that powers content collaboration across Office 365. So, now whether you are co-authoring in Office apps, emailing cloud attachments in Outlook, or collaborating with your team in the new chat-based workspace, Microsoft Teams—SharePoint provides a consistent set of experiences across the applications, along with the security and control that’s important to IT. Support for a broad range of file types—In addition to Office files, SharePoint can store any file and now supports viewing of over 270 file types, including Adobe Photoshop (PSD), Illustrator (AI), Acrobat (PDF), as well as video, 3D formats, and DICOM images. Personalized search and intelligence—Search is smarter, faster, and easier for you to find and filter results that include all SharePoint content, including files, sites, people, and now news and list items. 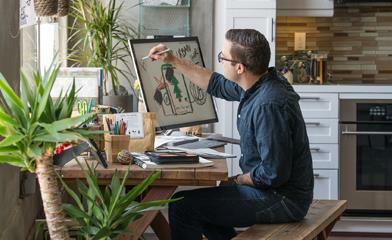 SharePoint even indexes objects, text, and handwriting inside other images. Scalability—SharePoint supports customers ranging in size from small businesses to organizations with hundreds of thousands of users and has a maximum tenant capacity of 30 trillion documents. Security and IT confidence—SharePoint leverages Microsoft security capabilities such as Advanced Data Governance for Retention and Records Management, Data Loss Prevention (DLP), eDiscovery, and Customer Key with consistent controls across Office 365. Deployment flexibility—Customers can choose their deployment model—cloud, hybrid, or on-premises—and leverage no-cost Microsoft FastTrack deployment, adoption, and migration services. Cloud leadership and compliance—With 100+ global datacenters and Microsoft’s global network edge—combined with compliance standards, including ISO 27001, FISMA, and EU Model Clauses—we offer customers trusted enterprise-grade compliance and security. At Microsoft Ignite last month, we announced an exciting new set of SharePoint innovations that build on this foundation. To learn more about how SharePoint can help you and your organization, visit our website and download our content services white paper. 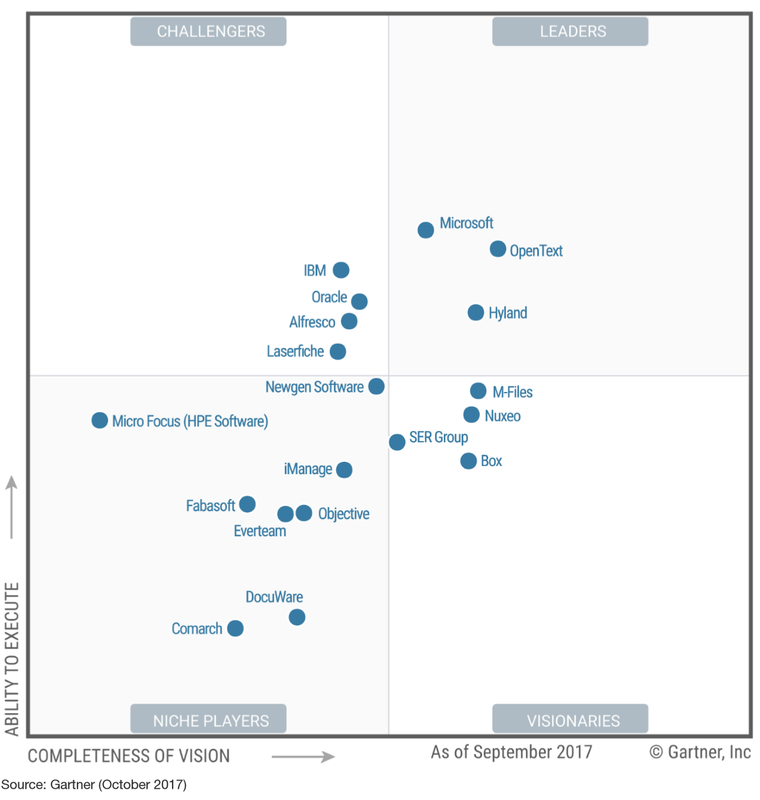 Finally, download your own complimentary copy of the Gartner Content Services Platforms Magic Quadrant. This graphic was published by Gartner, Inc. as part of a larger research document and should be evaluated in the context of the entire document. Gartner does not endorse any vendor, product, or service depicted in its research publications, and does not advise technology users to select only those vendors with the highest ratings or other designation. Gartner research publications consist of the opinions of Gartner’s research organization and should not be construed as statements of fact. Gartner disclaims all warranties, expressed or implied, with respect to this research, including any warranties of merchantability or fitness for a particular purpose.